This set places one or a couple of words of the ayah in one line of a column and gives their meanings side by side in another column, taking care to see that the flow and intelligibility of the English meanings are not thereby lost. This method enables the reader to identify which English words or phrases represent the meaning of which words in the Arabic text. It has the additional advantage of keeping the meaning strictly to the wording of the text or importing in the meaning any word or expression that has no correspondence with anything in the text. The numbering has been kept individual for each page. Also grammatical notes, particularly verb forms and verbal nouns, have been given as far as possible. As the words recur at different pages, so their meanings and grammatical notes also have been repeated, giving cross reference to at least one previous occurrence of the word, indicating the page on which and the number under which the word has been explained before. The aim has been to enable a non-Arab reader to understand the Quran as well as to improve his knowledge of Arabic, particularly the Quranic Arabic. This is a great resource. 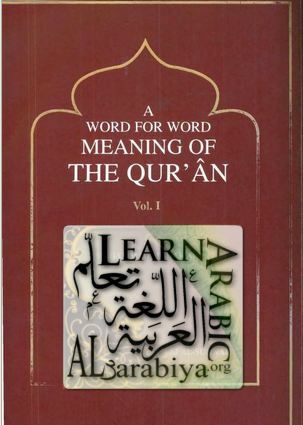 This will surely enable non-Arab readers understand Quran as well as grasp the Arabic language. Grammatical notes are important as well as one cannot help but “think English” while reading the Quran for the first time. Understanding grammar will improve comprehension as well as the pleasure of reading Arabic.